This is my third video in a series on magic eye tube projects. For background, please view the earlier blog post on magic eye tubes first. The first part of the pipeline is the FT232H breakout board. I obtained this from Adafruit. The FT232H is a pretty versatile board, it can do serial communication, I2C communication, SPI, and even GPIO. I’m going to be using it as a simple USB-to-I2C adapter. The Windows PC can send commands over USB to the board, and the board will convert those commands to I2C and send them to the next unit in the chain, the MCP4728. The MCP4728 is next up in the pipeline. It takes the I2C digital control from the FT232H and converts it to an analog signal. The MAC4728 is a 12-bit DAC converter, giving us 4096 levels of output. It supports four channels (we only need two, one for each tube). There’s a built in internal 2V voltage reference. So what this gives us is the ability to output a pair of 0-2V signals with 4096 bits of precision. We only use two of the outputs (“A” and “B”) and we send them to the next unit in the chain, the op-amp board. 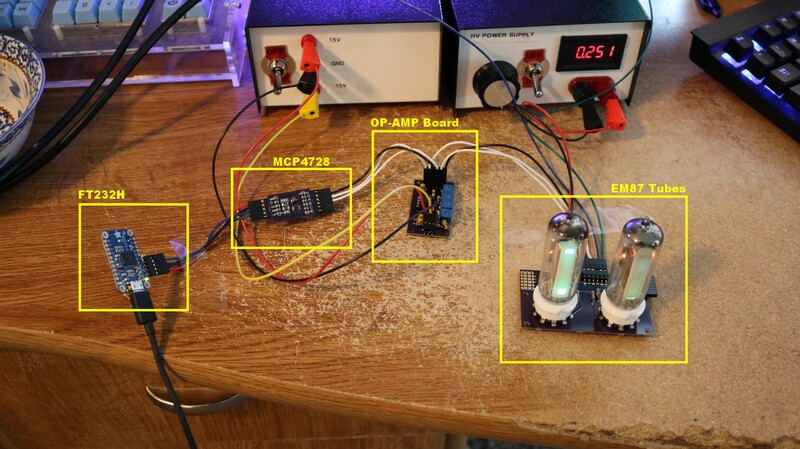 The op-amp board is described in my previous magic eye tube article, so I won’t say much about it here. To control the magic eye tubes, we need a signal that varies from zero to minux 16 volts DC. We will use an inverting op-amp circuit to take our 0-2V control signal (from the MCP4728) and convert it to the 0 to -16V output signal. I use a dual opamp chip, the LM358N, so we can handle both channels from the same board. 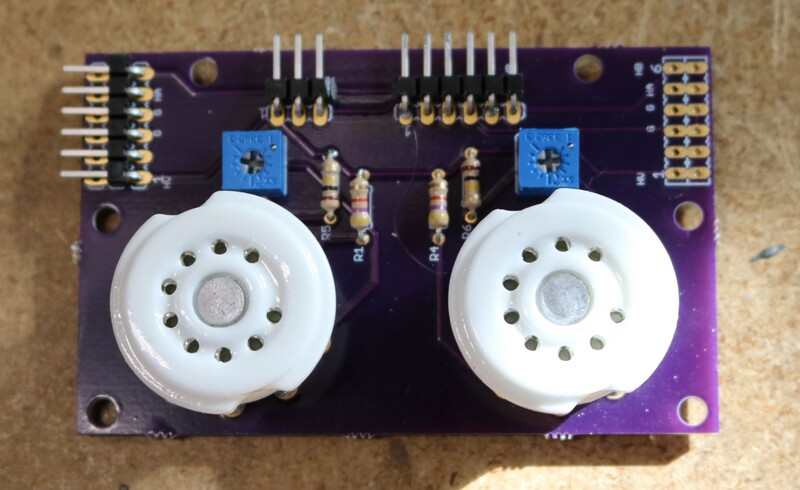 Each channel includes both an offset and a gain potentiometer. Finally, we get to the magic eye tubes themselves. 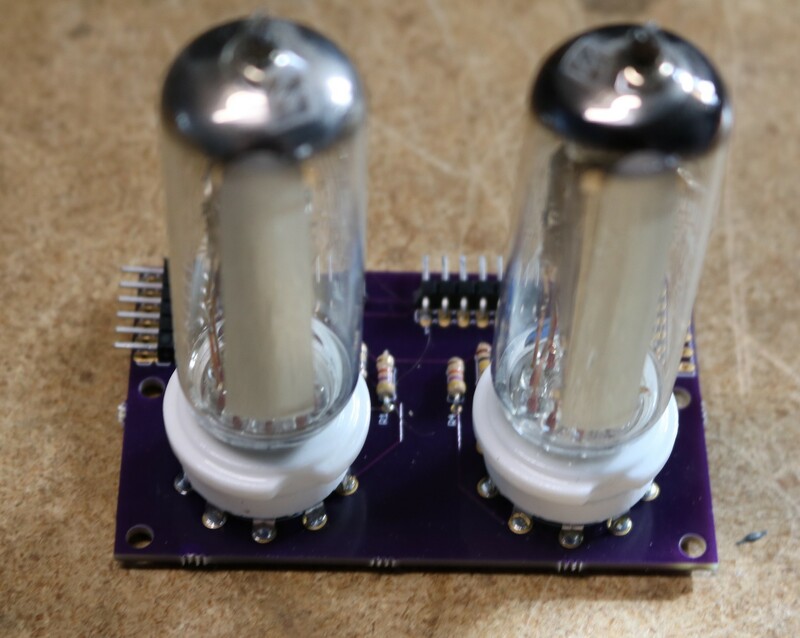 I’m using EM87 tubes on a custom breakout board that I had fabbed at osh park.